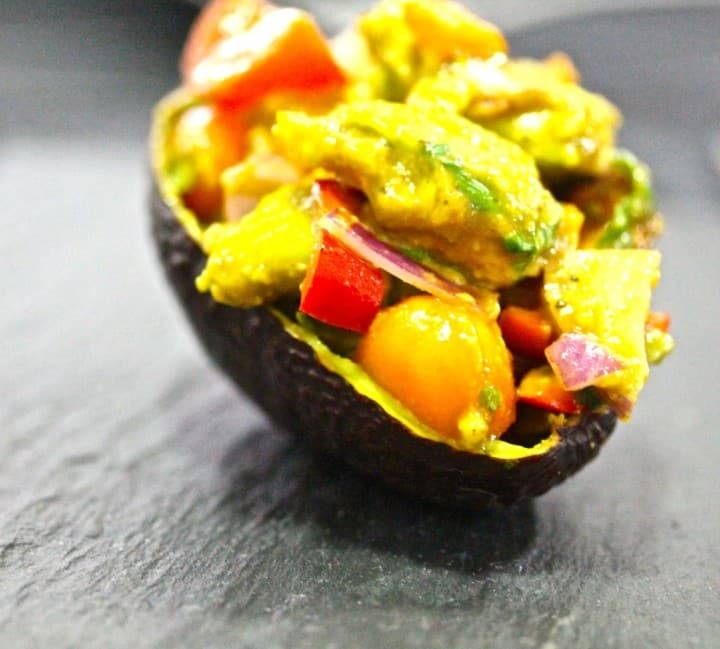 Deconstructed and reconstructed avocados | Is Life a Recipe? I saw some pictures somewhere of a really interesting concept for an avocado type dish and thought I’ll have a go at something similar, and in turn created my deconstructed and reconstructed avocados. A beautiful looking little dish, vibrant in flavour and colour and believe me it does not take too long. Hey and minimal washing up as you throw the bowls away. This is a superb side dish or starter. It’s quite acidic so it would be great with beef, or something with a strong sauce to cut through that. Plus I think my deconstructed and reconstructed avocados looks really nice back in the skin/shell. OK here we go with enough for four. This is very easy, so keep up. Carefully spoon this back in to the skins/shells – stack it on up and serve away. Pretty simple huh? Deconstructed and reconstructed avocados are delicuious and I think also look pretty damned amazing. I loved these. But also very quick to make right? But how nice does that look – ENJOY!!! No Replies to "Deconstructed and reconstructed avocados"